Despite being on the low end of Android, the Galaxy Y is quite up-to-date with Gingerbread 2.3.5. The topping of choice is Samsung's home-baked TouchWiz launcher and the result is quite good - the low resolution and limited screen estate aside. The lockscreen displays the current date and time, but the notifications are oddly selective. Incoming emails won't be displayed but missed calls and texts will. Once the Galaxy Y is unlocked you're greeted by the familiar TouchWiz homescreen. You can have up to seven panes to populate with widgets but you don’t have to use all the screens all the time. If you need less, deleting the extra ones will speed up navigation. You can zoom out with a pinch gesture to enter edit mode, where you can add, remove and rearrange the homescreen panes as you see fit. The notification area gives you various toggles and quick settings - Wi-Fi, Bluetooth, GPS, Sound and Auto rotation of the display. Missed events and download reports get displayed below. Pressing the menu button on the homescreen will let you put more content, add/delete homescreen panes or change the wallpaper (a press and hold on the homescreen does the same trick). Live wallpapers are supported too, though there is only one preinstalled and you will have to get the rest from the market. The context menu has shortcuts too for search, notifications and settings. The TouchWiz task manager is complete with a homescreen widget, which shows the number of currently active apps and saves you the need to install a task killer. Typically the main menu consists of side-scrollable panes, much like the homescreen, instead of a vertical scrollable grid (like in the vanilla Android). List view is not available, but you can rearrange icons whichever way you like within the grid. Before we get down to benchmarks, we hardly need to warn you that this is an entry-level phone. The Galaxy Y is powered by a 830MHz ARMv6 processor and has a total of 290MB of RAM available. These specs are nothing to write home about but the phone is reasonably fast and we were happy with the fluid response of the interface. Some of the usual benchmarks we use aren't compatible with the QVGA resolution, so they are missing here. The Galaxy Y will do fine at the routine tasks. Android 2.3.5 OS and the low screen resolution help it run faster and pull an overall acceptable performance. The phonebook of the Samsung Galaxy Y has unlimited capacity and all the functionality you could want. The application displays contacts stored in the SIM card, your Google account or in the phone memory. The TouchWiz interface has been at work in the phonebook bringing some special features. Instead of just flick-scrolling the list of people in the phonebook, you can search the entries by either typing the name of the person in the search box or by using the alphabet scroll at the right side of the screen. 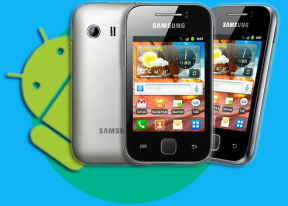 The Samsung Galaxy Y also packs the quick contacts feature, which first appeared on Android 2.1. Using a single click, it lets you use the contact photo in the phonebook to call, text, or email a contact. Each contact can have multiple email accounts and sync options include Exchange. There are many other details that you can assign to each entry, such as numbers, email addresses, IM, organization, and more. Clicking the plus sign on the right adds another field of that type, while the minus sign deletes it. The main contact list view hides some useful shortcuts too. Swiping your finger to the right on a name will dial the contact’s default number, while a swipe to the left will start the message composer. The side-sweeping shortcuts are part of the TouchWiz UI and work in other lists too where you have names or numbers (such as the messaging menu). The Galaxy Y handled calls trouble-free. The reception was consistently good and sound in the earpiece crisp and loud. We didn’t experience any dropped calls. Smart Dialing is available and works beautifully. Tap a digit and it searches both contact numbers and names containing it. If more than one contact is found, a button with a number and an arrow will display the rest of the matches. The call log is integrated in the dialer. It shows all the dialed, received and missed calls in one list, which can be filtered to show only certain type of events. We also ran our traditional loudspeaker test on the Galaxy Y and it got a Below Average score. Keeping this one in a purse or some deep dark pocket can result in missed calls due to an overall quiet speaker. More info on the test itself as well as other results can be found here.